From Wikipedia: “The lower Cuyahoga River has been subjected to numerous changes. Originally, the Cuyahoga River met Lake Erie approximately 4,000 feet (1.2 km) west of its current mouth, forming a shallow marsh. The current mouth is man-made, and it lies just west of present-day downtown Cleveland, which allows shipping traffic to flow freely between the river and the lake. Additionally, the U.S. Army Corps of Engineers periodically dredges the navigation channel of the otherwise shallow river to a depth of 27 feet (8.2 m), along the river’s lower 5 miles (8.0 km), from its mouth up to the Mittal Steel Cleveland Works steel mills, to accommodate Great Lakes freighter traffic which serves the bulk (asphalt, gravel, petroleum, salt, steel, and other) industries located along the lower Cuyahoga River banks in Cleveland’s Flats district. 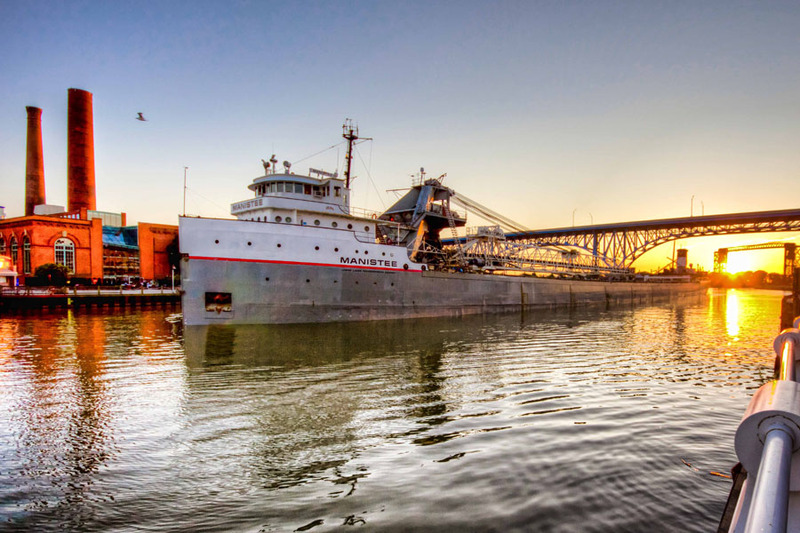 The Corps of Engineers has also straightened river banksand widened turning basins in the Federal Navigation Channel on the lower Cuyahoga River to facilitate maritime operations”.